At the 2007 census, the city of Suva had a population of 85,691. Including independent suburbs, the population of the Greater Suva urban area was 172,399 at the 2007 census. Suva, along with the bordering cities of Lami, Nasinu, and Nausori have a total urban population of around 330,000, over a third of the nation's population. This urban complex is known also as the Suva–Nausori corridor (not including Lami). Following the annexation of the Fiji Islands by the United Kingdom in 1874, the colonial authorities decided to move the capital to Suva from Levuka in 1877. The transfer was made official in 1882. Colonel F.E. Pratt of the Royal Engineers was appointed Surveyor-General in 1875 and designed the new capital, assisted by W. Stephens and Colonel R.W. Stewart. Suva sits in the middle of an urban conurbation that stretches from Lami, to the immediate west of the city, along the Queens Highway and Nasinu, on its eastern border all the way to the Rewa River, along the Kings Highway. 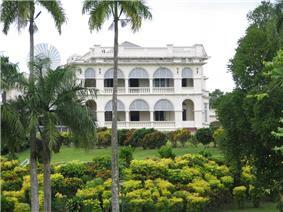 This conurbation, sometimes known as the Suva Urban Complex, continues till Nausori, over the Rewa River. The north of the city to its northeast contains the rainforest park areas of Colo-i-Suva and Sawani, along the Princes Road, connecting at the Rewa River Bridge. 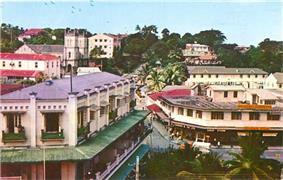 This entire conurbation, is generally referred to by locals as Suva, although it contains four local government areas. In formal reference, this complex has come to be known as the Suva–Nausori Corridor (where Lami is generally excluded) and is the most populous area in Fiji, with close to 350,000 people. Suva features a tropical rainforest climate under the Köppen climate classification. The city sees a copious amount of precipitation during the course of the year, with no true dry season due to no month having an average rainfall below 60 mm (2 in). Suva averages 3,000 mm (118.11 inches) of precipitation annually with its driest month, July averaging 125 mm (4.92 in). 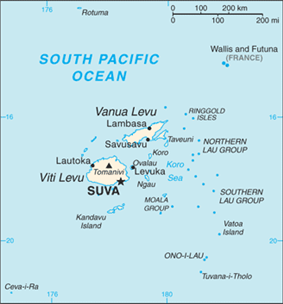 In fact, during all 12 months of the year, Suva receives substantial precipitation. Like many other cities with a tropical rainforest climate, temperatures are relatively constant throughout the year, with an average high of about 28 °C (82 °F) and an average low of about 22 °C (72 °F). 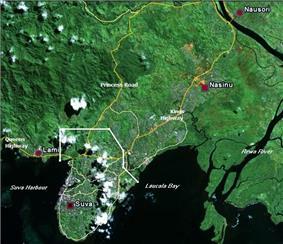 Suva is noted for its considerable rainfall, it has a markedly higher rainfall than Nadi and the western side of Viti Levu, which is known to Suva citizens as "the burning west". The First Governor of Fiji, Sir Arthur Gordon, allegedly remarked that it rained in Suva like he had seen nowhere else before and that there was hardly a day without rain. The most copious rainfall is observed from November to May, while the slightly cooler months from June to October are considerably drier. Suva is a multiracial and multicultural city. Indigenous Fijians and Indo-Fijians, the two principal ethnic groups of Fiji, comprise the bulk of Suva's population, and the city is home to the majority of Fiji's ethnic minority populations, which include Caucasians (Europeans or Kaivalagi), part-Europeans (of European and Fijian descent), and Chinese, amongst others. The majority of expatriates working in Fiji are based in Suva. The most widely spoken language is English, but Fijian, Hindustani, Cantonese, and other Indian languages are also spoken by their respective communities. 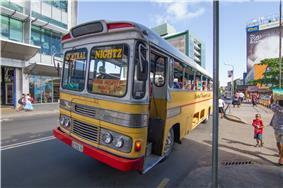 Suva has municipal status and is governed by a Lord Mayor and a 20-member city council. 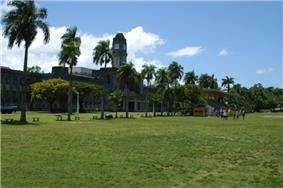 The Suva City Council is the municipal law-making body of the city of Suva, Fiji's capital. It consists of 20 Councillors, elected for three-year terms from four multi-member constituencies called wards. Councillors, who are elected by residents, landowners, and representatives of corporations owning or occupying ratable property in Suva, elect a Lord Mayor and Deputy Lord Mayor from among their own members; they serve one-year terms and are eligible for re-election. However, The current interim-government has reformed and restructured all municipal councils as of October, 2008 and the position of Mayor is now void. The position of Special administrator is currently in place, equivalent to that of mayor, but rather than elected, the administrator is selected by the Ministry of Local Government. Currently, Suva City's special administrator is Chandu Umaria, Former Lord Mayor and was responsible, in his term, for many of the city's beautification works. 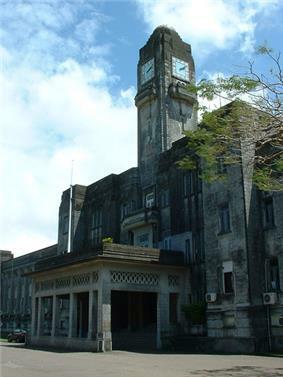 The Suva campus of the University of the South Pacific (USP) occupies what was once a New Zealand military base. It is the largest of the many USP campuses dotted throughout the South Pacific and the largest university in the Pacific Islands outside Hawai'i. It offers courses which are internationally recognized and endorsed. The Fiji Museum, in Thurston Gardens, was founded in 1904 and originally occupied the old town hall, but moved to its present location in 1954. The museum houses the most extensive collection of Fijian artefacts in the world, and is also a research and educational institution, specializing in archaeology, the preservation of Fiji's oral tradition, and the publication of material on Fiji's language and culture. 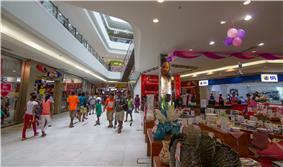 In December 2009, there was an addition to Suva's skyline with the opening of TappooCity valued at USD25.7 million (FJD50 million) a joint venture six storey low-rise building project by FNPF & Tappoo Group of Companies as Fiji's (and South Pacific's) largest department mall at present outside Australia & New Zealand. Unlike most cities and towns in Fiji and indeed many around the world, Suva did not grow around one industry but has gradually developed as a hub and one of the largest cities in the Pacific Islands. Suva is the commercial centre of Air Pacific (now called Fiji Airways and Air Fiji were headquartered in Suva. The TRAFFIC Oceania South Pacific Programme - funded by the UK Foreign and Commonwealth Office, is in Suva, in the offices of the WWF South Pacific Programme. The programme assists in the implementation of CITES and strengthens collaboration with the World Wide Fund for Nature. The Council of Regional Organisations in the Pacific. 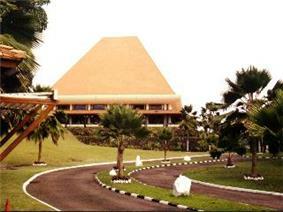 The Fiji Institute of Technology which is a major polytechnic in Fiji and caters students from many small Pacific Island nations. 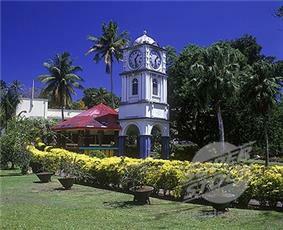 It has centres in other Fiji towns of Nadi, Ba and Labasa. The Secretariat of the Pacific Community (SPC). 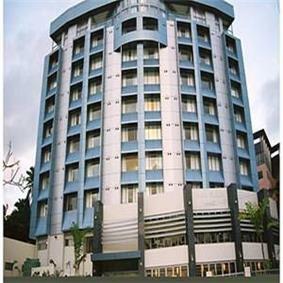 Suva is host to many regional, national and local events and has very developed and advanced venue options. The Vodafone Arena - Seats 4000 - 5000 people depending on configuration. Many concerts are held in Suva, some coming from other countries to enjoy world-class performances. Concerts and shows are usually staged at one of the above-mentioned venues on a monthly basis. Some of the famous music artists to hold shows in Suva include UB40, Lucky Dube, O'Yaba, Sean Kingston and many others. Due to a favoured interests in Bollywood by all, some prominent singers and actors have held shows in the capital which includes singers like Shaan, Sonu Nigam, Sunidhi Chauhan and movie artists like Shah Rukh Khan, Priyanka Chopra, Johnny Lever, Dino Morea, Rajpal Yadav and the like. Another interesting feature of Suva is the increasing number of Bollywood films being shot in the capital: By the middle 2012 alone, there have been around six movies partly shot in Suva. 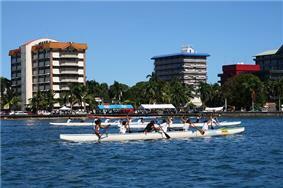 Suva was the host of the first Pacific Games, in 1963. Forty years later in 2003 the Games returned to Fiji's capital, with a full program of 32 sports introduced for the first time. Suva held the games for the second time in 1979. Having hosted the event three times, Suva has held the Pacific Games the more often than any other city. Nausori International Airport caters mainly to the domestic market, connecting Suva with Fiji's other international airport, Nadi International Airport, and serves smaller international aircraft, at one time servicing Brisbane and Sydney routes. As of August 2010, Air Pacific will operate a twice weekly flight from Nausori International Airport to Auckland, New Zealand to complement its 13 weekly flights from Nadi to Auckland, furthermore, the Nausori - Sydney route is expected to resume in the later half of 2012. The airport provides services to its immediate Pacific neighbours Tonga and Tuvalu as well as the dependency of Rotuma. Suva has a public transport system consisting of buses and taxis servicing the metropolitan area as well as the cities of Nasinu, Nausori and Lami town. There are bus services connecting Suva with other towns and cities on Viti levu by way of either the Kings, Queens or Princes highways, all originating within Suva, although the latter terminates at Rewa Bridge in Nausori. As of January 2012, a feasibility study was being conducted by JRK and Associates, in partnership with Canadian company Hatch Mott McDonald, to construct and operate a monorail train network from Suva, across the Suva - Nausori Corridor to ease congestion and traffic problems. The construction of the monorail system is expected to begin in the first quarter of 2013. ^ "Fiji Islands Bureau of Statistics - Population and Demography". Statsfiji.gov.fj. Retrieved 10 October 2012. ^ "Ba ex-mayor says Fiji municipal reform was expected". ^ "About Beihai - Sister cities". Beihai Government. Retrieved 25 November 2008. Fiji, by Korina Miller, Robyn Jones, Leonardo Pinheiro - Travel - 2003, published by Lonely Planet, pages 139-141, details on Suva City. A History of the Pacific Islands: Passages Through Tropical Time - Page 162, by Deryck Scarr 2001 - 323 pages.